The internationally acclaimed Chinese State Circus is coming back after a break of three years, returning to its roots in an innovatively spectacular new production – “DYNASTY”. The incomparable Chinese State Circus will be playing at Sandown Park from Thursday 30th March to Sunday 2nd April in its fully heated big top venue. Breathtaking in its simplicity, “DYNASTY” projects into a contemporary setting an art form that has thrilled audiences for more than 2,000 years where low-tech everyday objects are transformed into hi-tech acrobatic equipment. Hurtling porcelain jars…dynamically spinning plates…balancing upon gigantic pyramids of tables and chairs framed by the delicate strands of silk supporting cascading aerialists. Stunning world class Chinese acrobats, aerial artistes and jugglers interact with the super-human physical skills and dexterity of the masters of martial arts – the legendary Shaolin Warriors. The nonstop action from start to awesome finale as thrill follows thrill is set to a soaring musical score accompanied by the rhythmic beats of Chinese percussion. Its outstanding acrobatic achievement that could until now could only be created video through special effects – yet performed live in front of an audience what seems impossible becomes a reality. It is what has earned the CHINESE STATE CIRCUS the accolade “incomparable”. no gimmicks…no fakes…no retakes…quite simply…the incomparable Chinese State Circus. The achievements of 33 very special young people were celebrated at an awards ceremony at Shepperton Film Studios on Wednesday 13 March. Organised by Spelthorne Borough Council, the Spelthorne Youth Awards recognise the outstanding talents and achievements of local young people and the contributions they make to their communities. Guests on the night were treated to two fantastic performances by Spelthorne Young Voices who sang two songs, followed by a short theatre piece by Dramatize, a theatre arts group for young people with disabilities. Mother’s Day Gift & Craft Fair. 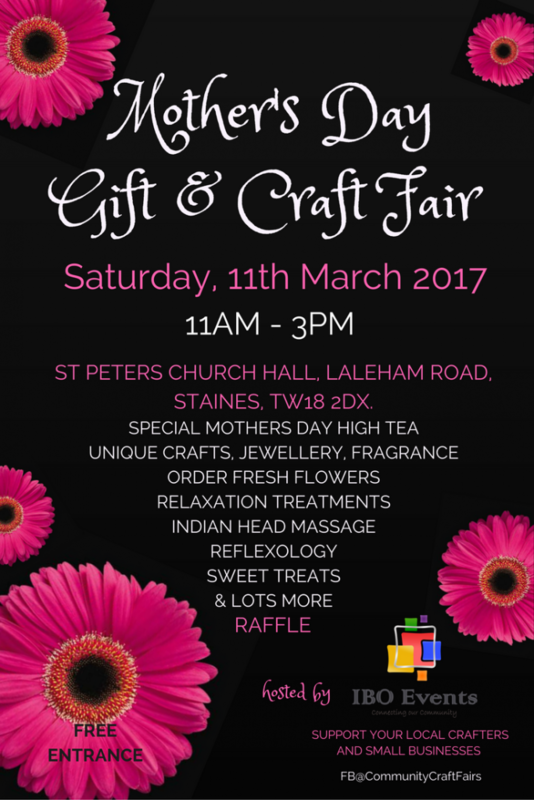 Saturday 11th March, 11-3pm, St Peters Church Hall, Laleham Road, Staines upon Thames. We’ve 30 amazing craft and small business stalls there, each offering something quite delightful and unique for that extra special Mother’s Day Gift … you know Mums worth it!! Fabric crafts, wooden crafts, hand painted cards, boutique clothing, fragrances, glass pieces, beautiful flowers to order, and lots more! We also have a wonderful vintage High Tea planned for that extra special treat for Mum! We’d love for the community to pop down and join in the fun! FREE entrance, limited FREE parking too!